Miyako Odori | Ready, Set, Kimono! Miyako (都) means capital and odori means dance, thus making the name, “The Capital City Dance.” The first performance of Miyako Odori took place in 1872, three years after the capital was moved from Kyoto to Tokyo in 1869. The goal of Miyako Odori was to counter the loss of status that came when the capital was moved. The first dance was choreographed by Yachiyo Inouye the third, the master of the Kyomai Dance School and performed by the maiko and geiko of Gion Kobu. It was such a success that it has been performed every year since then. 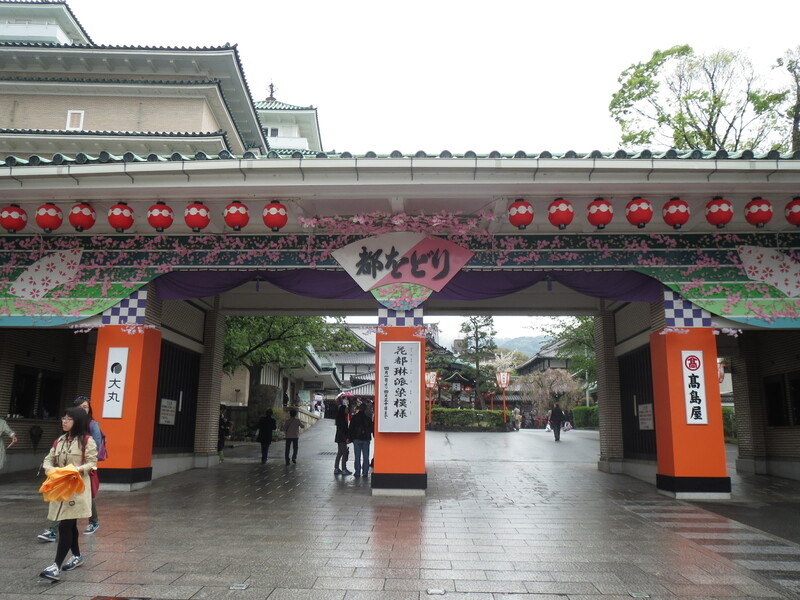 Every year, there are things that remain the same about Miyako Odori. The Kyomai School is always responsible for choreographing the dancing, and the maiko and geiko of gion always perform the dances (the other geisha districts have their own dances). There are always eight scenes and the scenes always progress from a spring themed dance to summer, then autumn, then winter, and finally back to spring. 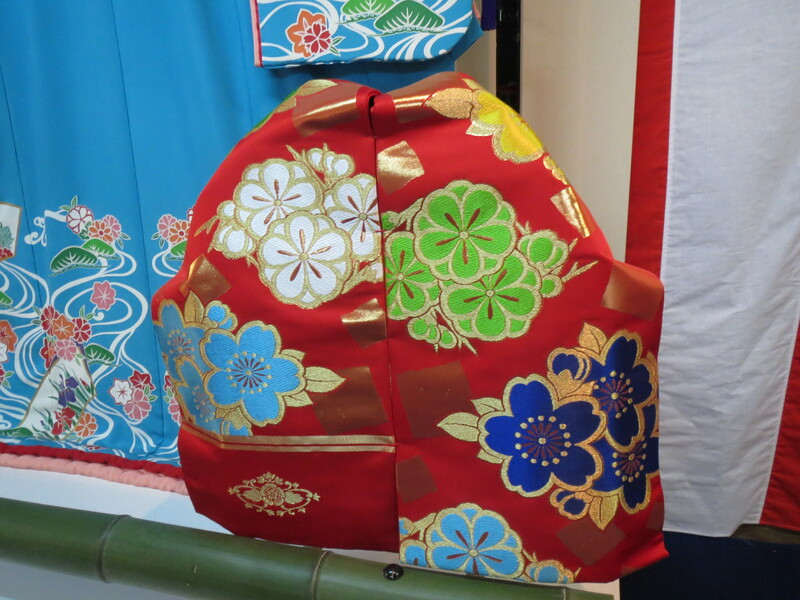 The kimono for the chorus dancers are usually blue (some years are green) with small modifications in the design and the obi are usually red. 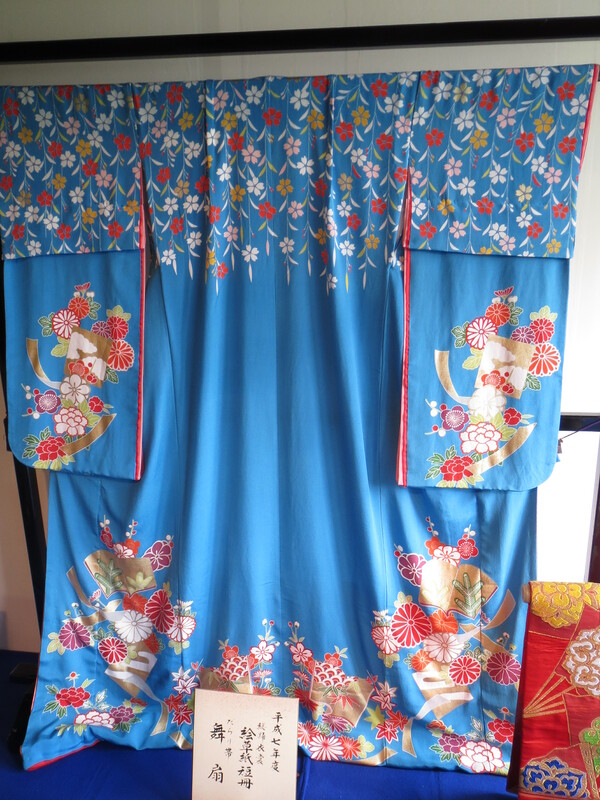 Both kimono and obi always have motifs from all four seasons. 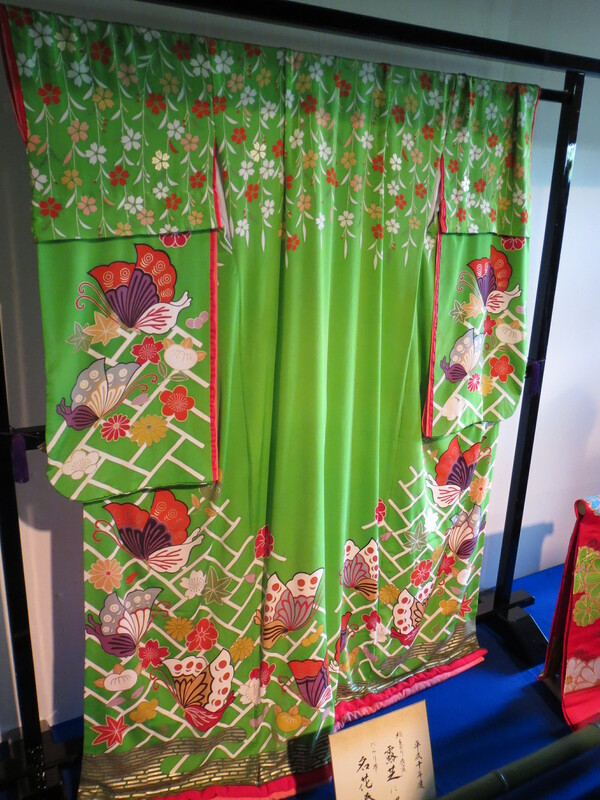 The kimono are always created by kyo-yuzen artists and the obi are always woven by nishjin artists. 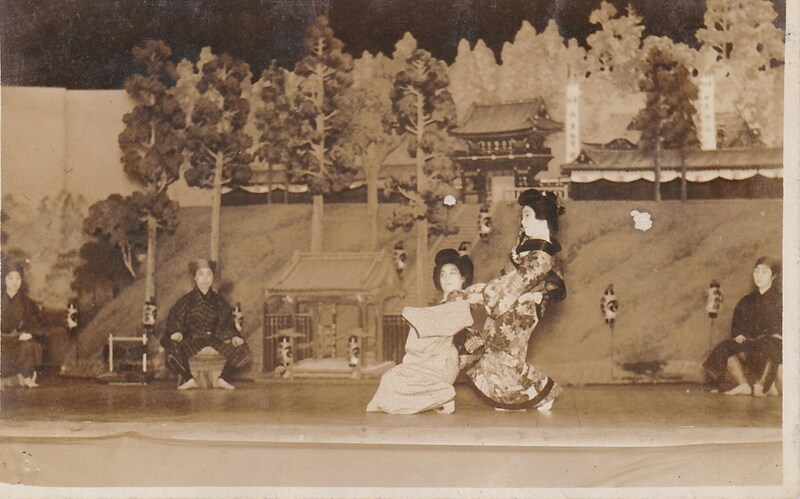 Undated photo of a past performance of Miyako Odori. 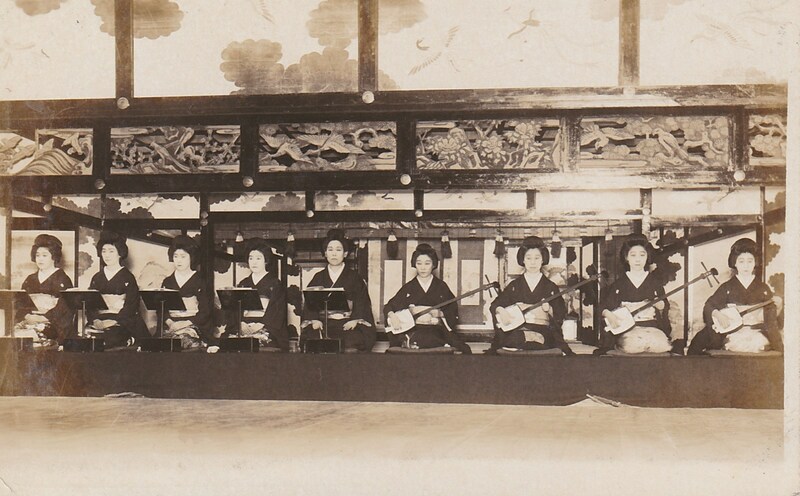 Undated photo of a previous Miyako Odori performance. 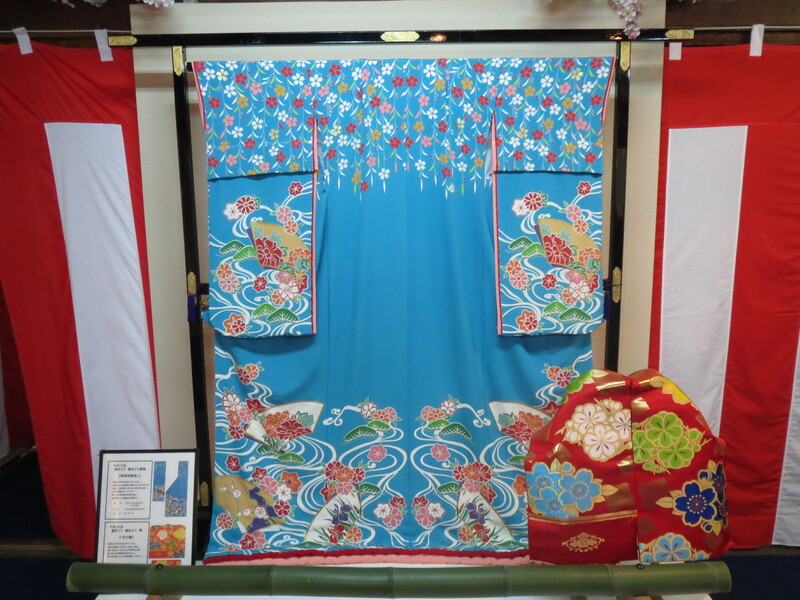 Miyako Odori takes place every year during the whole month of April, with four shows happening each day. Buying tickets has gotten much easier over the last few years. Tickets start going on sale in September, and you can order them through the official website here. I went this route. They emailed me a confirmation number, and on the day of the show, I showed up at the box office, showed them the email confirmation number on my phone, and picked up the tickets. Quick and painless. There are three classes of tickets you can choose from. Second class seats are 2500 yen, first class seats are 4200 yen, and special class seats are 4800 yen. The more you pay, the better your seats are in the theatre. 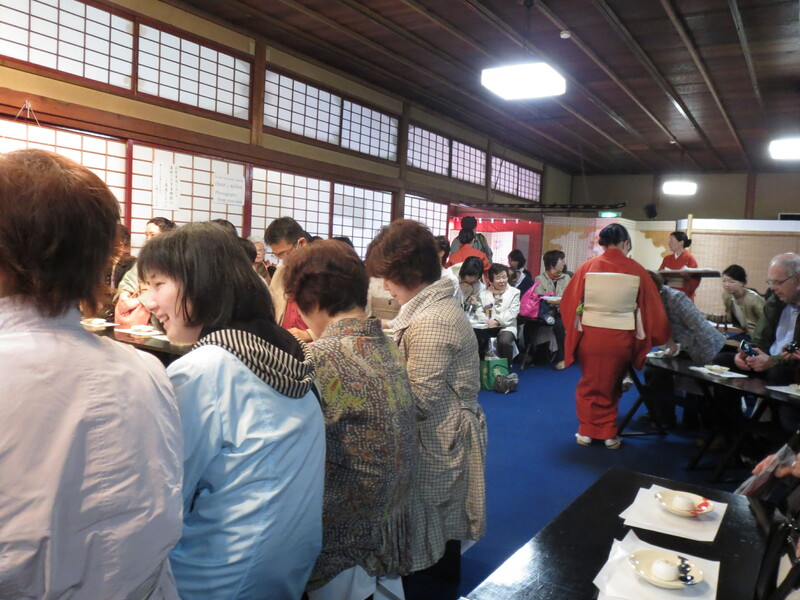 In addition, the special class tickets allow you to experience a tea ceremony performed by a geiko, complete with a souvenir plate to take home. I decided to go for the special class tickets. Getting to the theater is very easy too. The dances are held in Gion Corner, a theater that is used to showcase a mix of different traditional arts to tourists for the rest of the year. It’s in the middle of Gion and there are signs and lanterns everywhere announcing the path. If that isn’t enough, the crowds of people and the police directing them should be a dead giveaway. One of the many posters lining the street to the theatre. The entrance to the theatre itself. The rain that day destroyed my plans of wearing kimono. 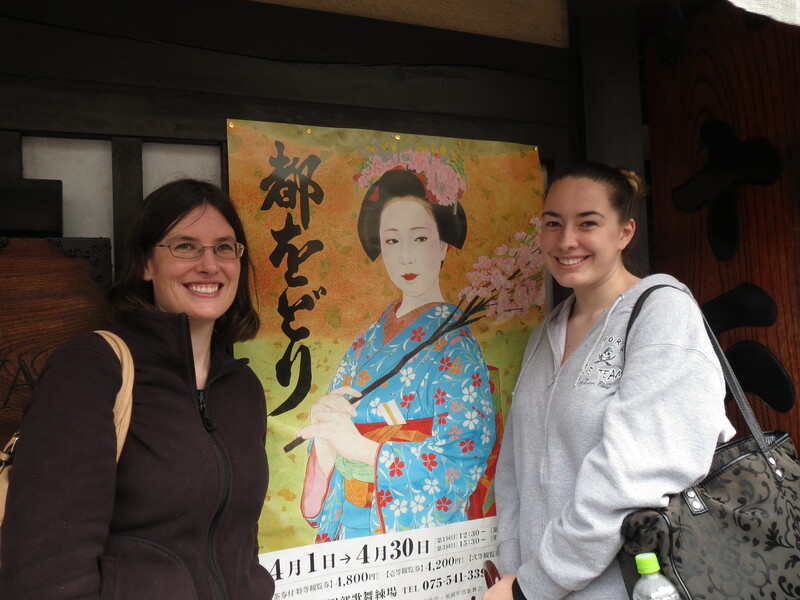 Before we entered the tea ceremony, we went through a mini museum, if you will, that showcased a history of the tea ceremony and the instruments that are used. You can also see kimono and obi from past performances. We were all herded into a waiting room that looked out onto a beautiful Japanese garden. 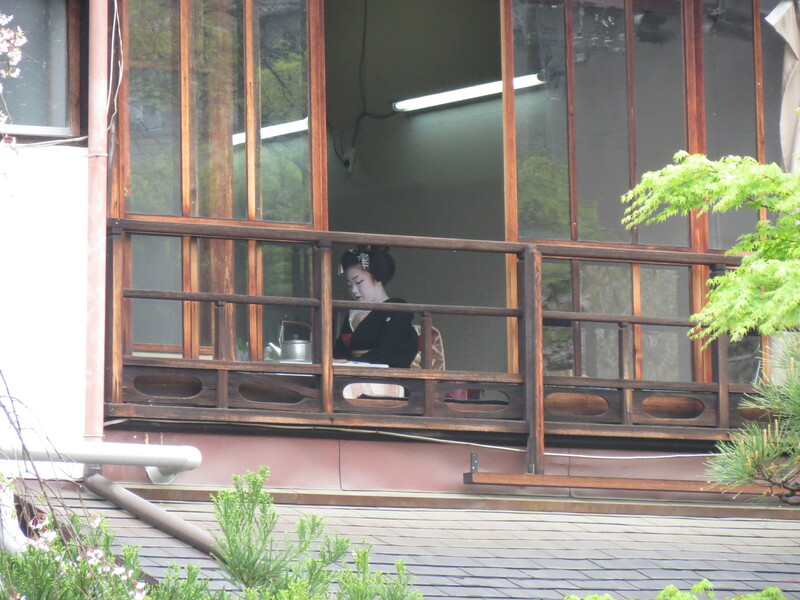 It had the added bonus of letting us sneak a peak of the geiko about to perform the tea ceremony preparing in a room on the other side of the garden! A sneek peak of what was to come! The tea ceremony I felt was very touristy. It was held in a large room with tables and stools for the guests to sit at. As soon as you walked in, waitresses directed you where to sit and they served out the sweets on the souvenir plates. 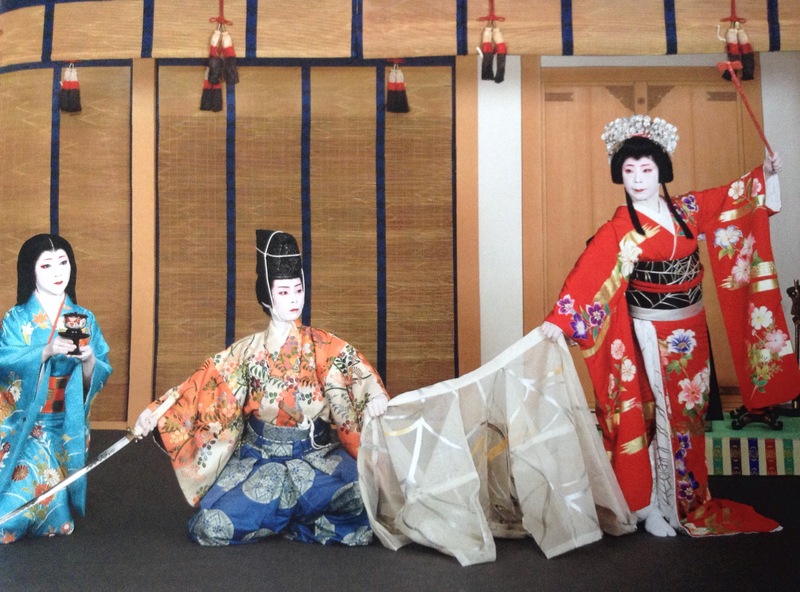 After that, the geiko and maiko came in and the shutters started snapping. I admit, I was guilty of taking photos as well, but after three or four shots just to remember everything, I put the camera down and tried to enjoy the ceremony. But I have to say, it was very difficult with the man in front of me who never put down his large, professional grade camera with a zoom lens. He was snapping photos every few seconds and it took away from the mood. No cameras were allowed during the dancing and I think the same policy should be enforced for the tea ceremony. 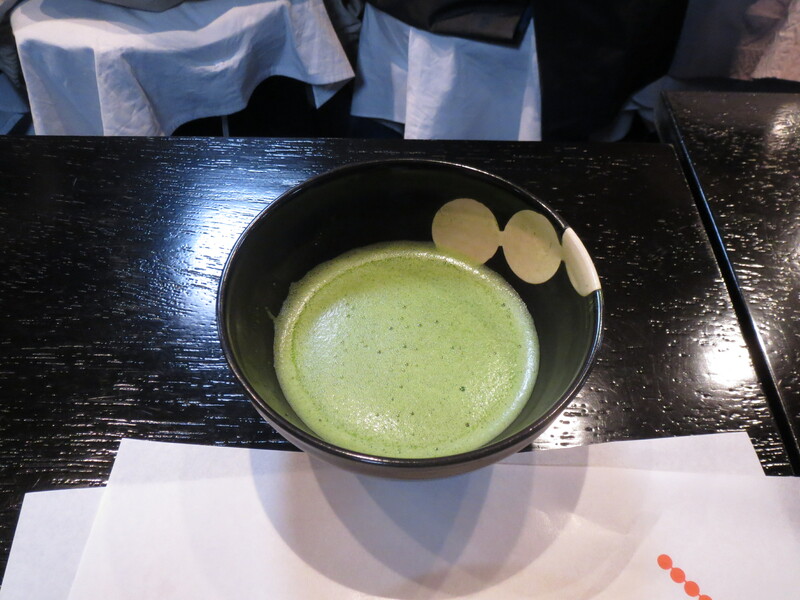 While the geiko was preparing the tea, the waitresses were serving bowls of matcha tea. Nobody touched the tea or the sweets until there was an announcement over the loudspeaker saying it was ok to start eating. 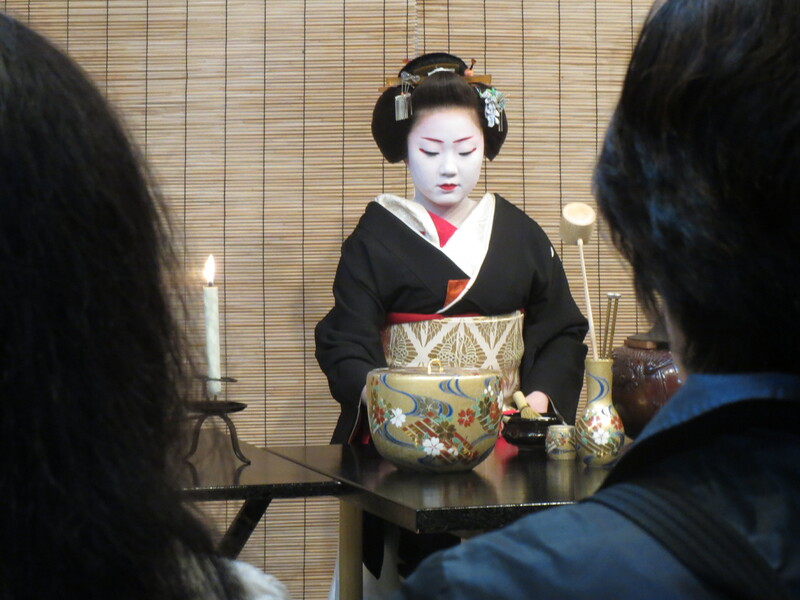 The tea prepared by the geiko was served to one random guest by the attending maiko and once again the shutters went off like crazy. The whole thing lasted about ten minutes, and at the end, everyone wrapped up their plates and were herded through to the “souvenir center” while waiting for the theatre to open up. The geiko preparing the tea. 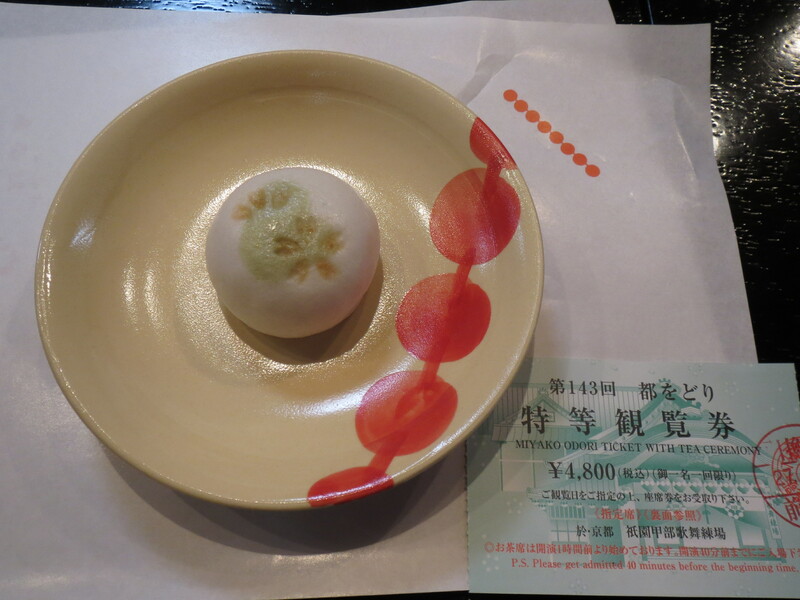 My sweet on the souvenir plate, along with my ticket. The souvenir center had the usual Kyoto and Japanese souvenirs; books, postcards, snacks and such. But they also had something really unique. 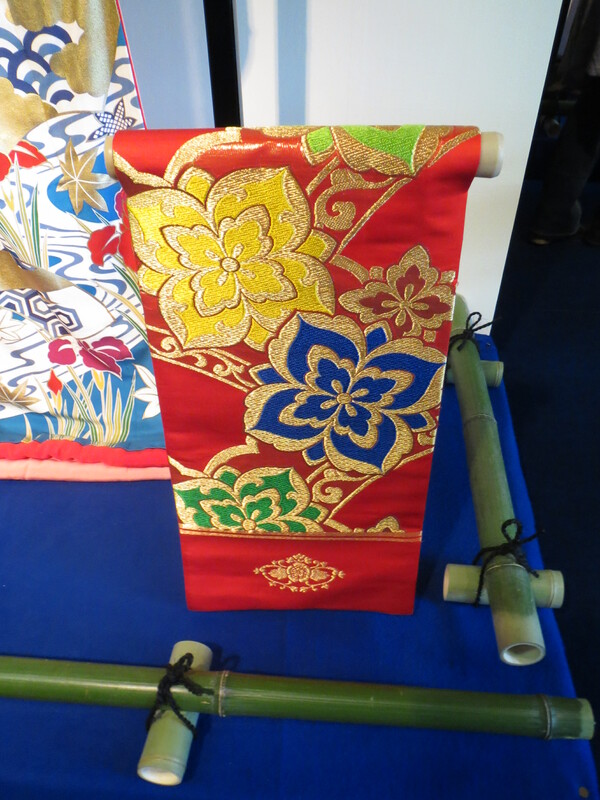 They had taken kimono and obi from previous years and made different souvenirs out of them. 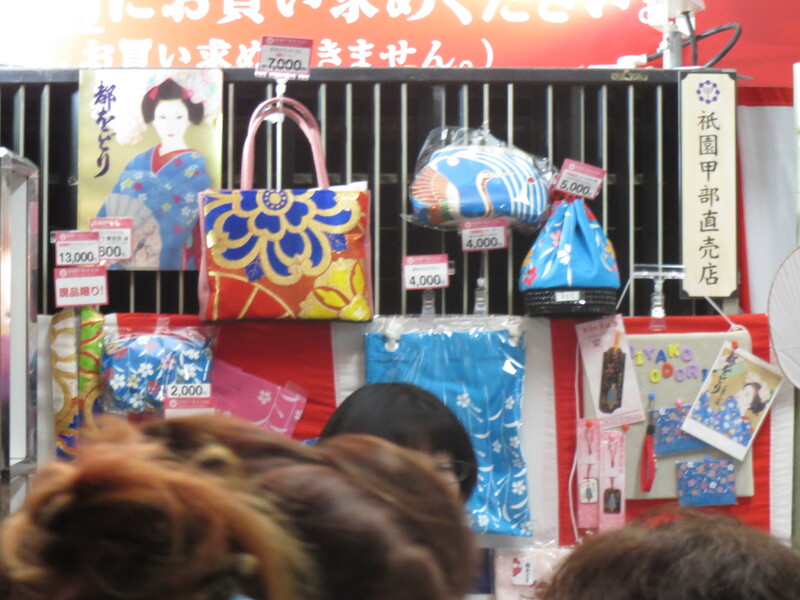 There was everything from bags and wraps to smaller things like coin purses and tissue cases. I indulged in a tissue case. And I do mean indulged because these items were not cheap. Not that I expect them to be. 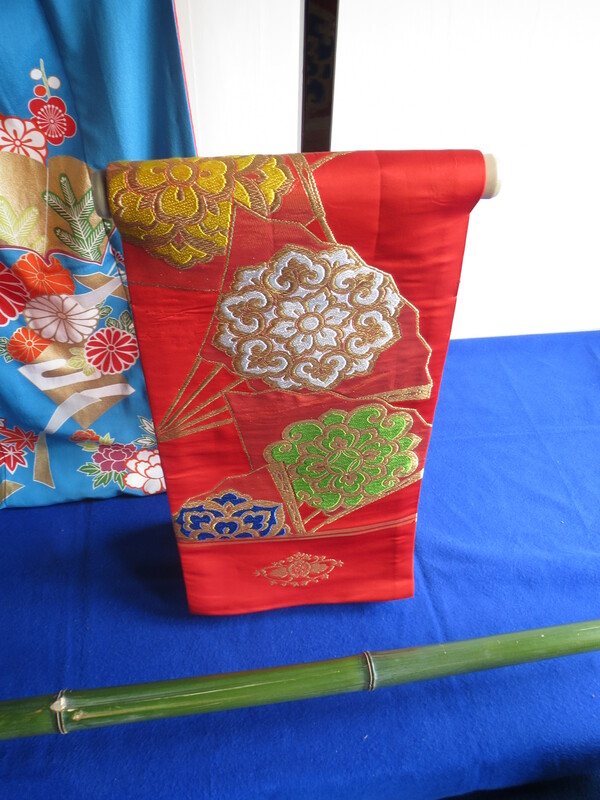 After all, they are made from kimono and obi created by some of Kyoto’s finest craftspeople. I just wish my budget could have allowed me to get the 7000 yen purse made from an obi that I was drooling over. 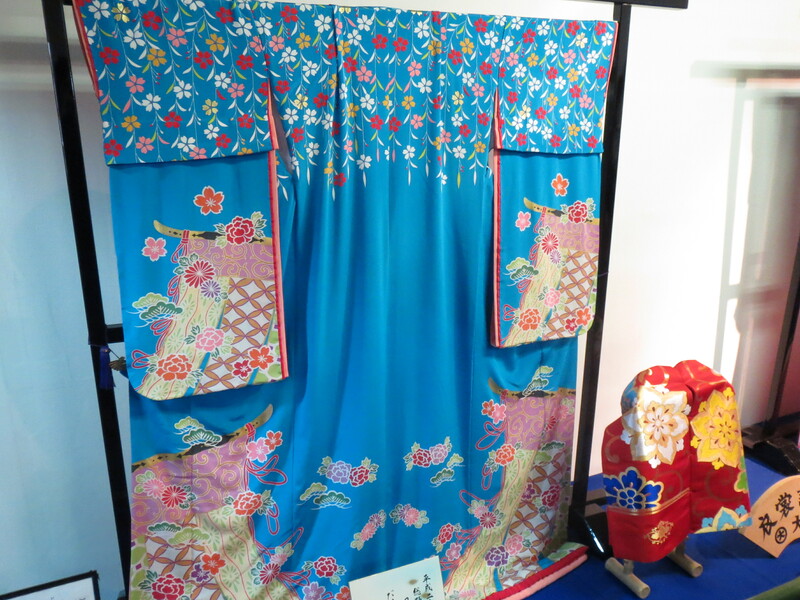 A slightly blurry photo of souvenirs made from previous year’s kimono and obi. A clearer photo of the souvenirs. I guess buying my tickets six months in advance really paid off. We got front row seats! We could literally see the dancers sweating! 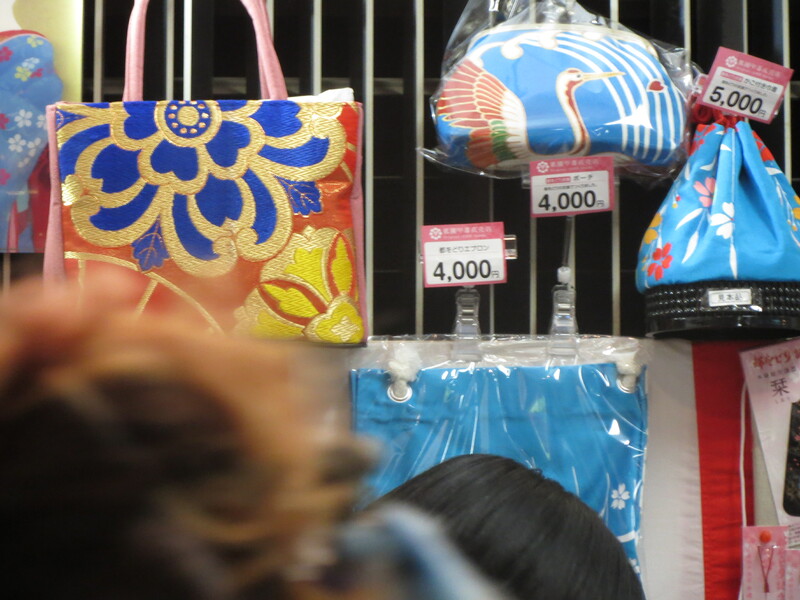 And it gave me a great vantage point to look at their kimono and their kitsuke. Nothing in their kimono, obi, or accessories shifted or moved. It was absolute perfection. In fact, at some points I thought it was too perfect. For the chorus dancers, their obi was tied at the back with two tails. When they spun, only the bottom third of the tails moved with the force of the spin. The upper two thirds of the obi stayed perfectly in place. I suspect that there’s a couple of stitches keeping the tails together and stopping them from moving too much! Still gorgeous to watch, but I’m not going to use their kitsuke as a model to shoot for. It’s like using an airbrushed model as a reference for how skinny you should be. Just not realistic. 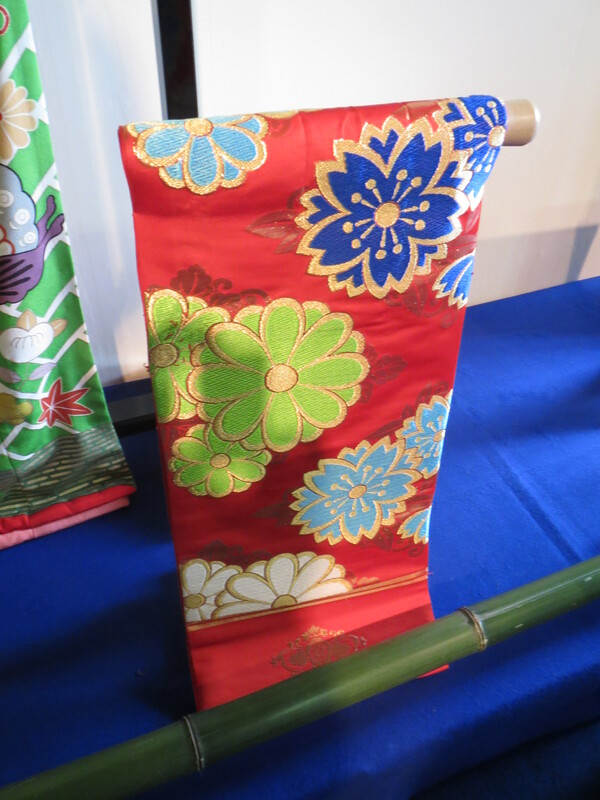 An obi on display. Can you spot the small stitches that keep the two halves in place? One thing I would highly recommend for everyone is to pick up the program that they offer for 700 yen. It has a description of every scene in English as well as headshots of every maiko and geiko performing on stage as either a dancer or a musician. It was a huge help for me to understand what was happening in each scene, and it’s a great souvenir for after. There are some great pictures inside of each scene that they perform. 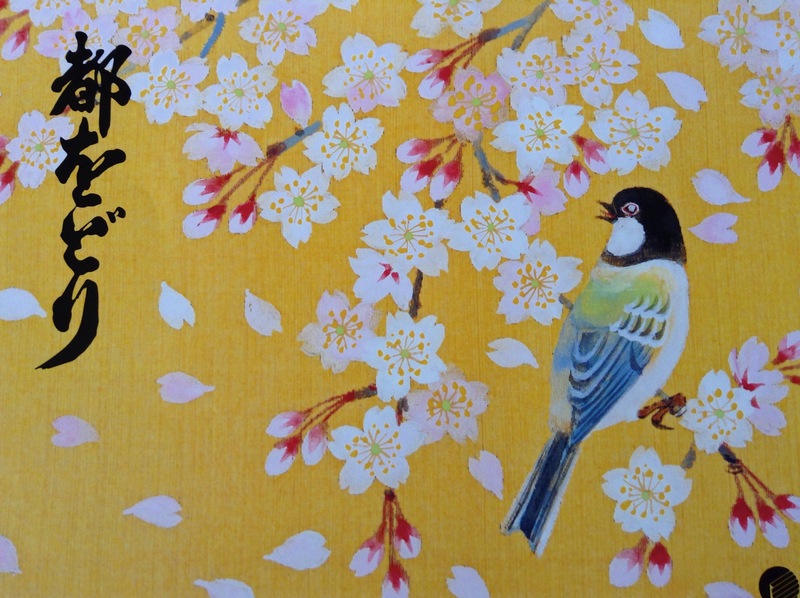 The cover of my program for Miyako Odori. 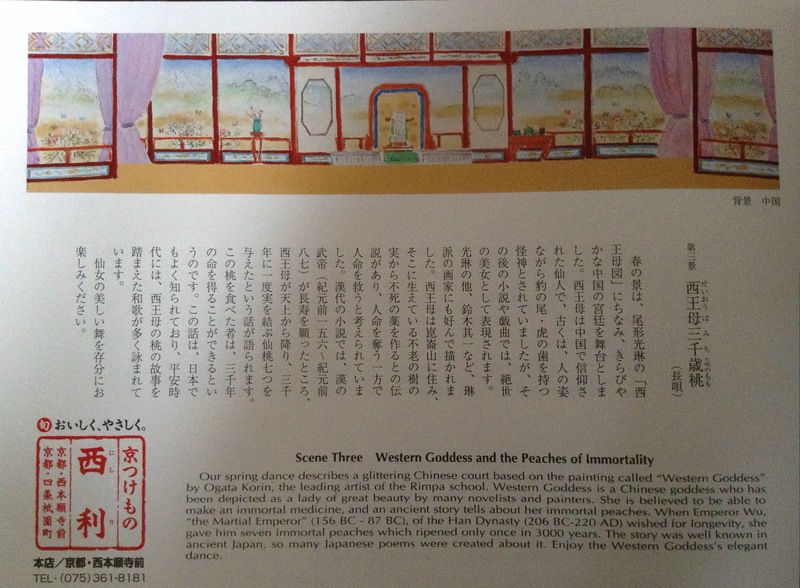 A page out of the program with a description of a scene in both Japanese and English. 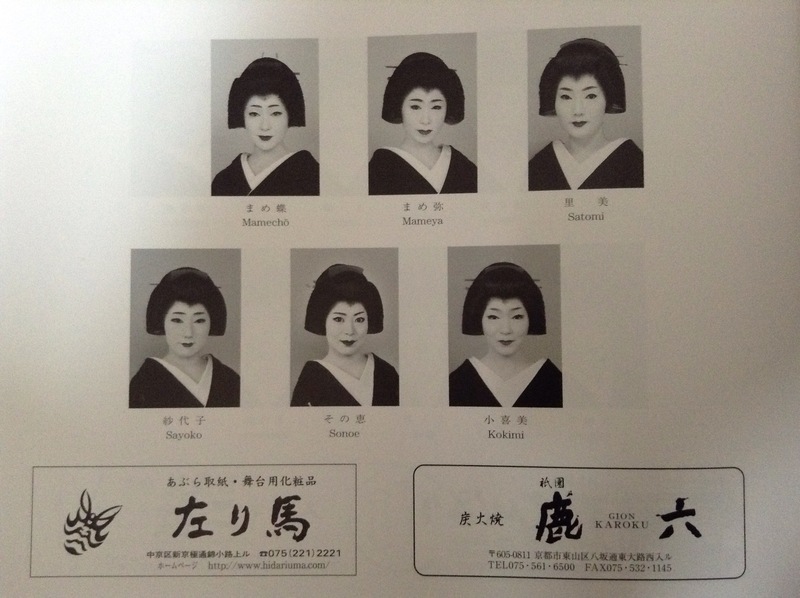 A sample page of the headshots of the geiko and maiko that appear in the performance. This can also be found in the program. Every year, the dances start with an opening scene with the chorus dancers (in the recognizable blue kimono) showcasing that highlights of the dances to come. The number of dancers for Miyako Odori has steadily declined over the years as the population of maiko and geiko has also declined. 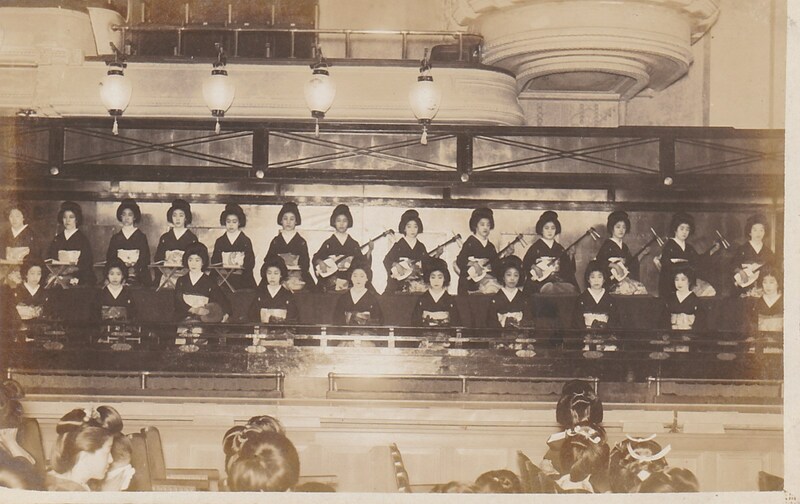 In her book Geisha, Liza Dalby claims that during her time as a geisha in 1974-75, the ranks of the dancers would be filled out with high school girls. I don’t think this is the case nowadays, but I do question some of the “maiko” in the opening scene. With front row seats, it was easy to see the dancers’ faces, and some of them looked to be on the plus side of forty years old. They still danced beautifully, but I wonder what their story is. Are they just geiko who are filling out the ranks, or are they dance students who have been recruited? All I know for sure is that some of the ladies on stage were too old to be maiko. The remaining seven scenes always go in order from spring to summer, autumn, winter, and then back to spring. The year that I went (2015) the dances included a story about the western goddess and her peach of immortality, a scene from the Tale of Ise, Minamoto no Taiko and the Earth Spider (she had spiderwebs on her obi!) and two lovers traveling in winter mountains. The dancing was incredible, but I would have never understood what was haping without that program! My favourite kimono! The dancer on the right is the Earth Spider. Check out her obi! What can I say? 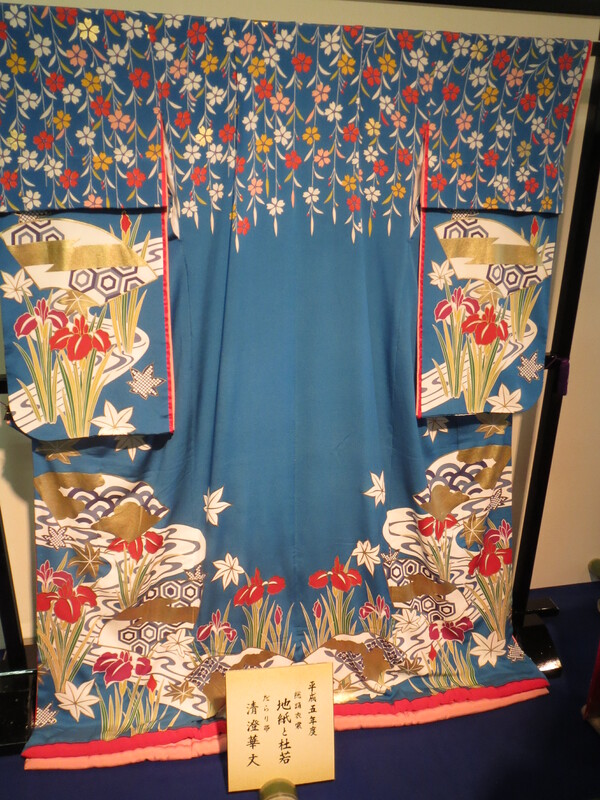 The kimono on display were gorgeous. I loved examining them between the tea ceremony and the dances. Here’s a sampling of what I saw. Here’s a video of the 143rd Miyako Odori, the show that I got to see.